Online ticket sales have ended. You may purchase tickets on the day of the tour at the Park House. Happy Holidays! We hope you’ll join us for our Annual Holiday Parlor Tour! On Sunday, December 11, nine beautiful homes and one church will be decorated in their finest for the holiday season. A true St. Louis holiday tradition, our home tour is a unique annual event showcasing one of the largest collections of Victorian homes in the nation. The tour begins at the Park House, located at the corner of Mississippi and Lafayette Avenues. You will pick up your tickets and tour book there. Amenities include complimentary carriage rides, a trolley between tour homes, live music, strolling carolers, and Santa. Neighborhood shops and restaurants will be open, with many offering treats and discounts. The tour is conducted as a self-guided, open house format: attendees are welcome to visit homes in any order at any time during tour hours. If you’d like to see all of the tour homes, please allow at least three hours. Our Holiday Parlor Tour features only the first floor of each home. All homes have several stairs leading to the entrance; we regret that we are not wheelchair accessible. A free trolley will be running in a loop around the neighborhood to save you a few extra steps between homes. Refreshments will be available at the newly renovated Kern Pavilion (formerly known as “the Boathouse”) in Lafayette Park, as well as in neighborhood establishments. Tickets cost 25 Day of the Tour and children under 12 are Free. Tickets are non-refundable. The tour is held rain or shine. 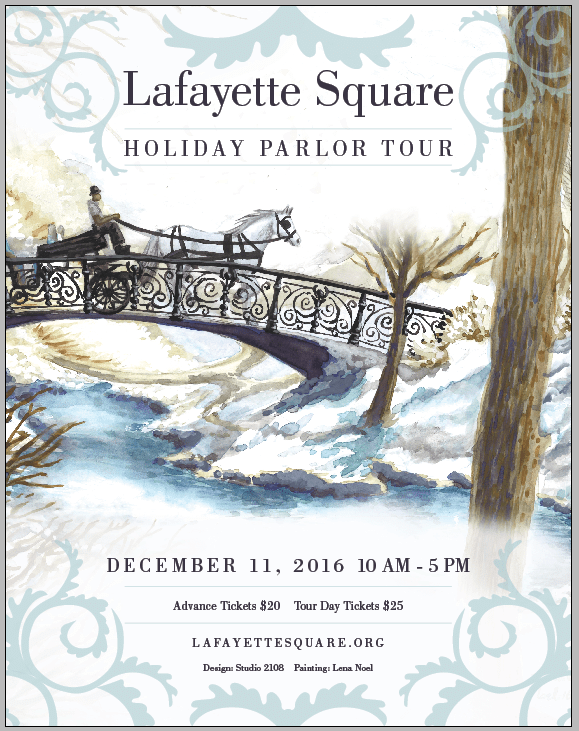 Advance tickets must be picked up on Tour Day – we do not mail paper tickets. .
Lafayette Square merchandise, current and previous house tour posters and holiday gifts will be available for purchase during the tour in the Kern Pavilion, located inside Lafayette Park. For further questions, please see our FAQs or contact us at housetour@lafayettesquare.org.